We're quickly approaching February, which means Valentine's Day is on the horizon! 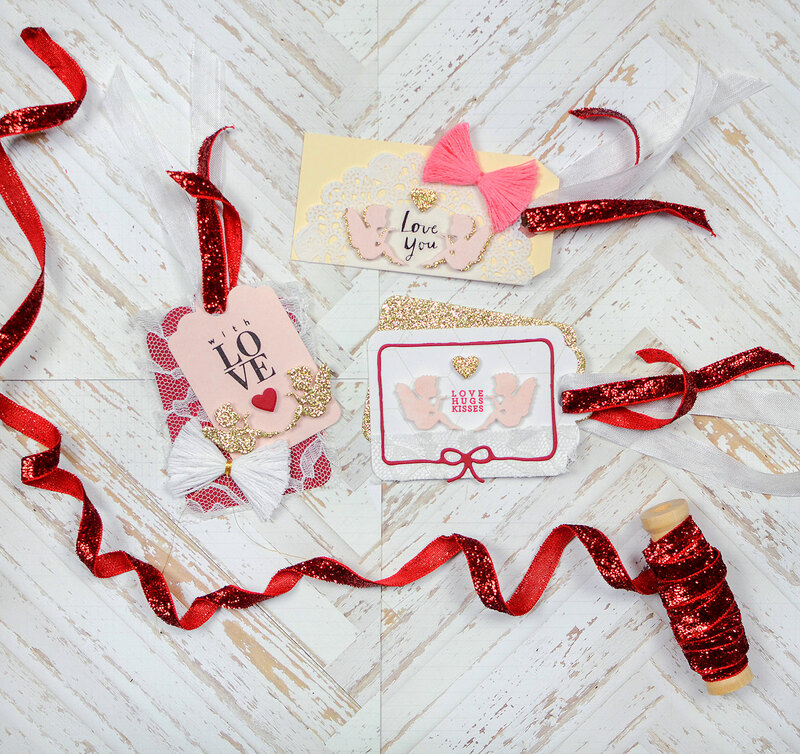 I don't know about all the sappy sentiments about love or whether it really is just an excuse for a certain greeting card company to sell more cards, but I do know that I LOVE to make valentines! 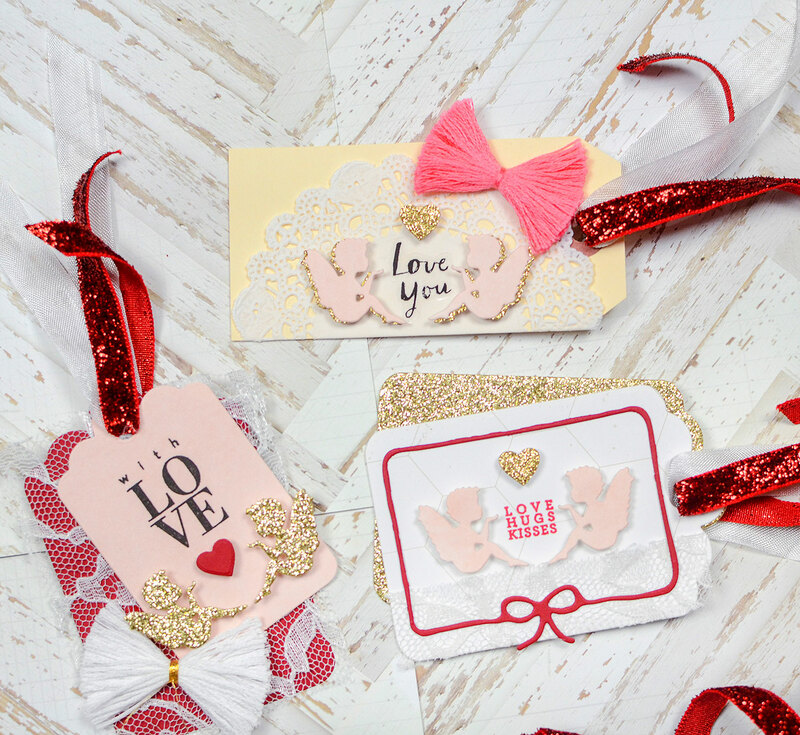 I received the cutest little pair of angels dies at the end of last year from Alexandra Renke and they are absolutely perfect for adorning sweet tags. They're small (less than 2" high) and facing each other like they're blowing a kiss. 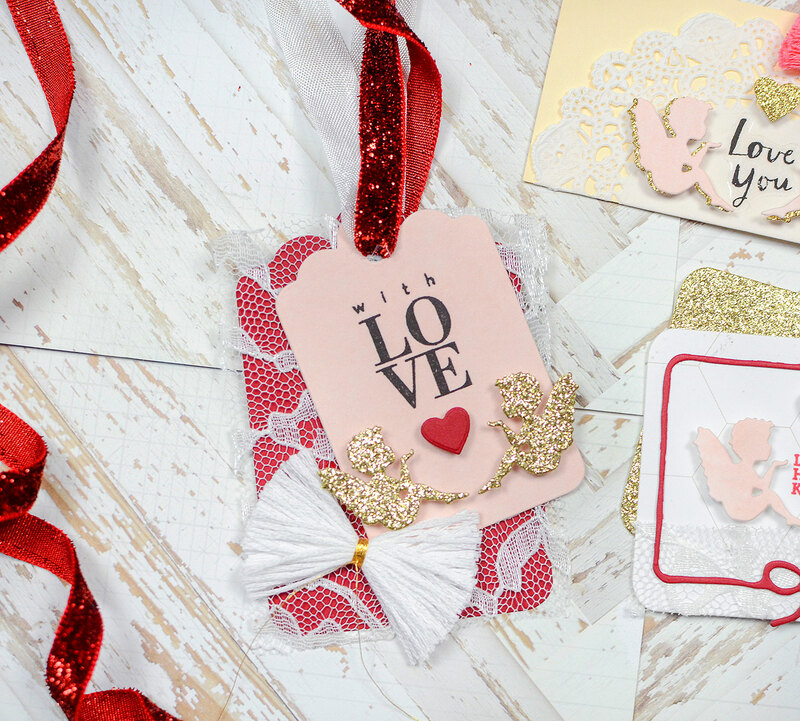 They come wired together with an itty bitty heart, but you can use all 3 pieces separately. I cut a few out of different papers, plus some bigger hearts, and set to work creating my tags. I happened to have this manila and doily tag already laying on my craft table so I took a couple of pale pink angels, offsetting them over a pair of gold glitter angels, and adhered them to the tag. I took a heart, cut from the Heart on Washi Tape die, and centered it above them. All of my hearts and angels on all of my tags are attached with 3-D foam dots. Gotta love a bit of dimension! The sentiment in between the angels is a sticker from the Crate Paper/Maggie Holmes Willow Lane collection. I added a pink floss bow and some pretty ribbons for attaching to packages. 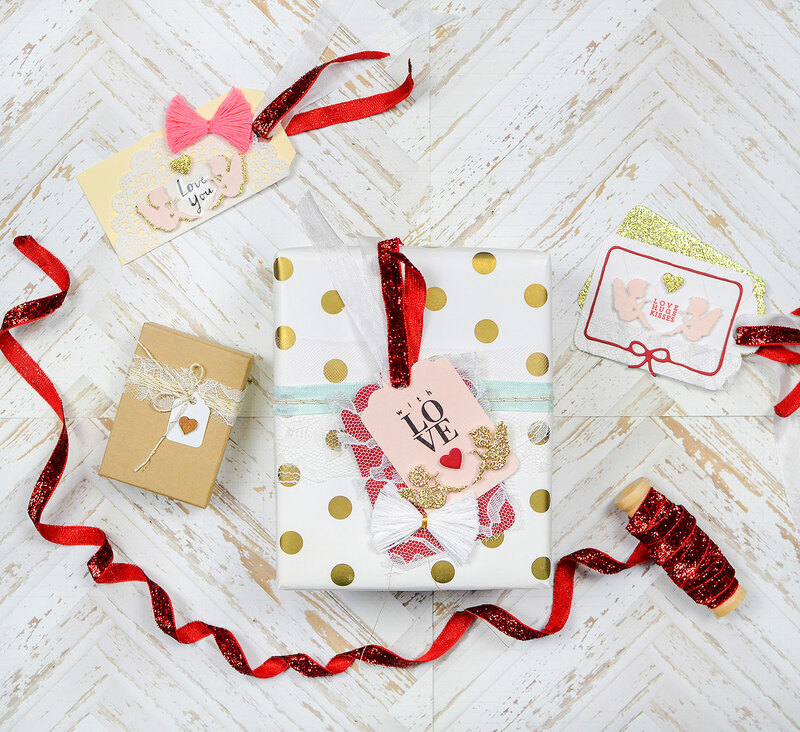 I love this deep red glitter ribbon--it's a great contrast to the rest of this soft-colored tag. My next tag features a scalloped tag that I cut from a paper scrap. I wanted a subtle background, but not too busy or too white. The angels are cut from pink paper again and enclosed in a framed ribbon die cut. 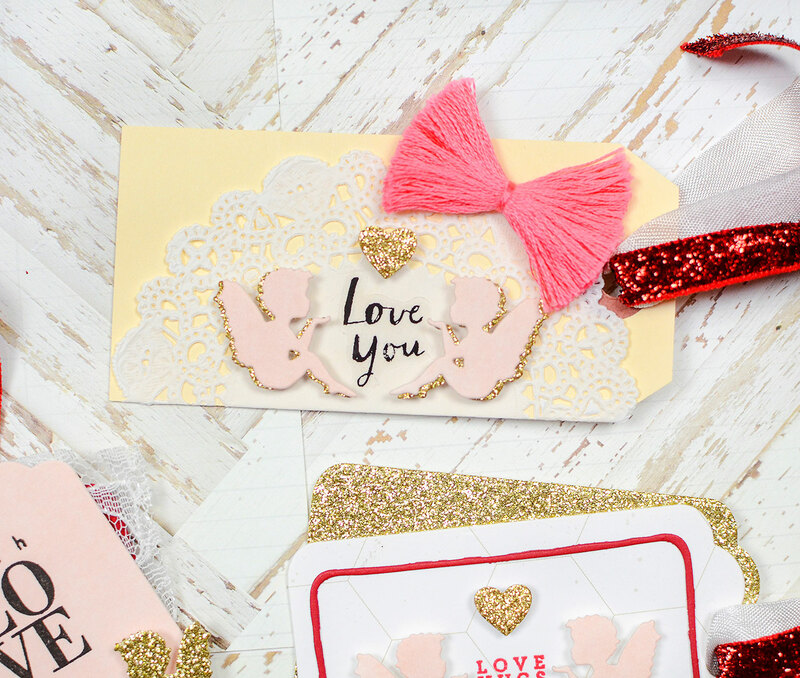 A bit of lace, another gold heart, and a tiny stamped message completes the piece. 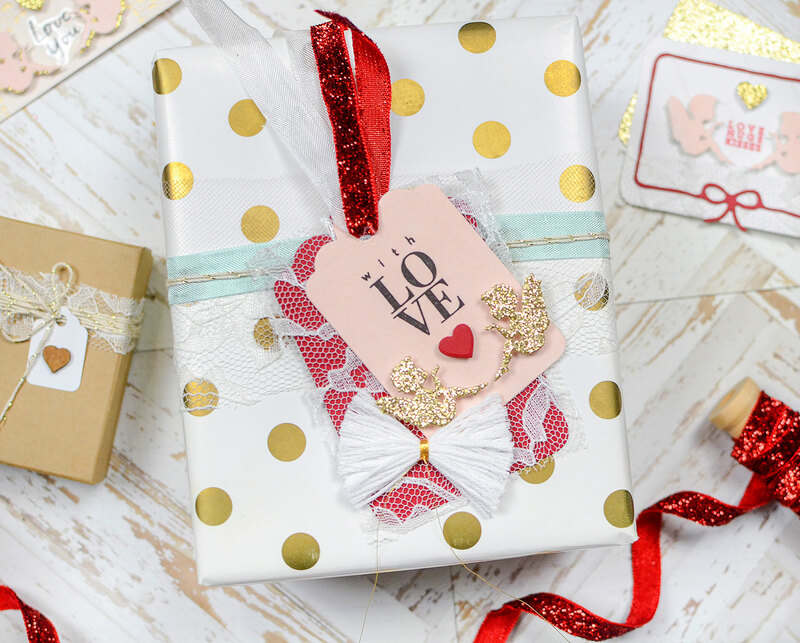 I've layered the top tag with a gold glitter tag, and added more of the same pretty ribbons. The white ribbon is seam binding, if you were wondering. For my last tag, I started with a large scallop tag base in red card stock, which has been overlaid with lace. I cut a smaller version of the tag from the pale pink paper, and stamped "WITH LOVE" on it in black ink. The angels are glittery gold here and the heart is red to match the bottom tag. I added a white floss bow and the red and white ribbons again. I'm not quite sure what I'll do with these tags yet, but I always love to have them just in case I need them! If you're looking for some cute angels, Alexandra Renke's dies are really sweet! She has some different versions of them, too. If you're in the US, you can find an assortment of them in the Ellen Hutson store; if you're international, you can find them (and so much more!) on Alexandra's website.